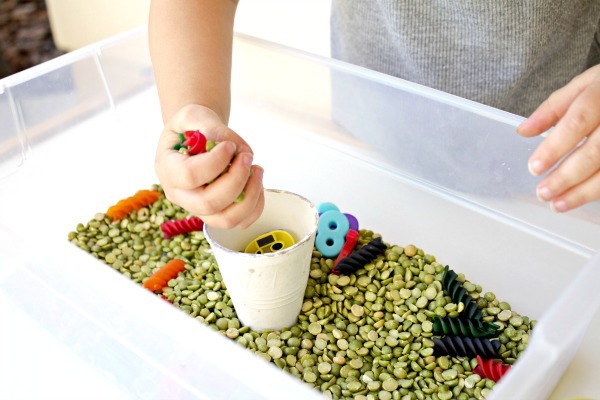 Sensory bins are a fun way to invite kids to engage in hands-on exploration of new concepts and learning themes. 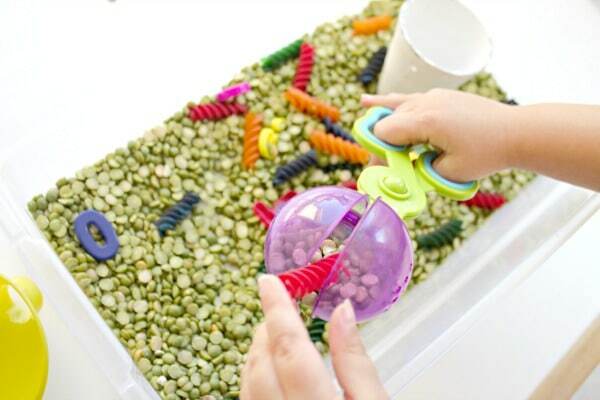 We love sensory bins as they can be fine tuned and used for so many different age groups! We recently introduced a counting caterpillars spring sensory bin to our caterpillar learning theme. 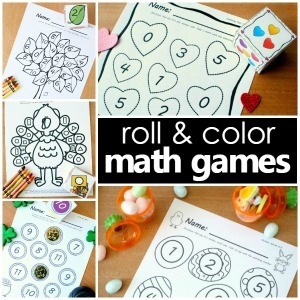 Using just a few materials, children are encouraged to use hands-on imaginative play and math skills such as color and number identification, sorting, patterning, and one-to-one correspondence. 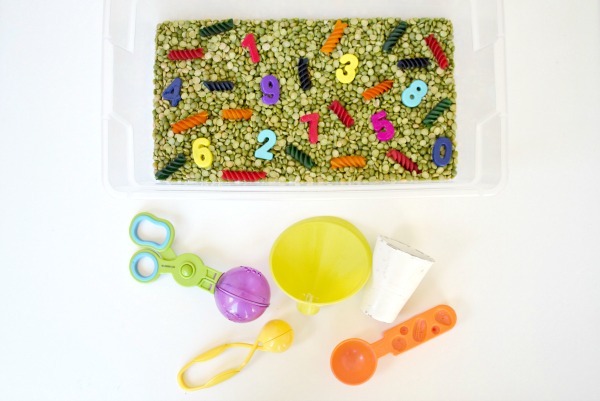 To assemble your caterpillar math sensory bin, grab a small plastic bin and your favorite sensory bin filling material. We used green split peas. If you’re looking for a non-food option, paper mache grass or real grass may serve as a good alternative. Add some loose numbers as manipulatives. We used some magnetic numbers we had on hand. 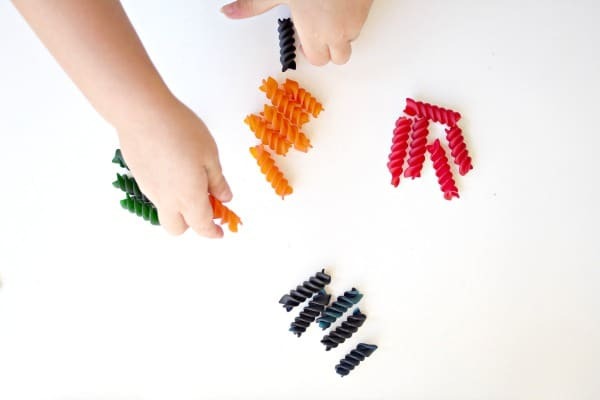 Next, gather some uncooked rotini pasta to represent your caterpillars. We chose to dye ours in order to provide more opportunities to extend math concepts. Separate pasta into plastic storage bags. Add one tablespoon of vinegar to each bag. 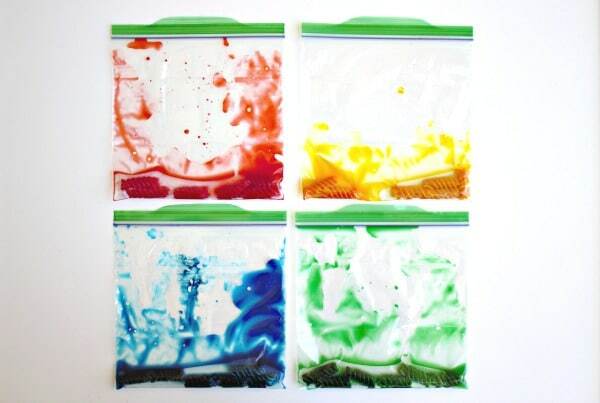 Add 3-5 drops of desired food coloring. Mix contents and allow to soak for at least an hour. Transfer contents to an aluminum pan and allow to dry for an hour or more. We placed ours outside in the sun. Caterpillar Counting Sensory Bin Fun and Learning! See the caterpillar sensory bin in action. 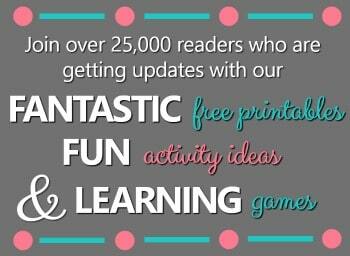 Then read on for more specific details for play and learning. 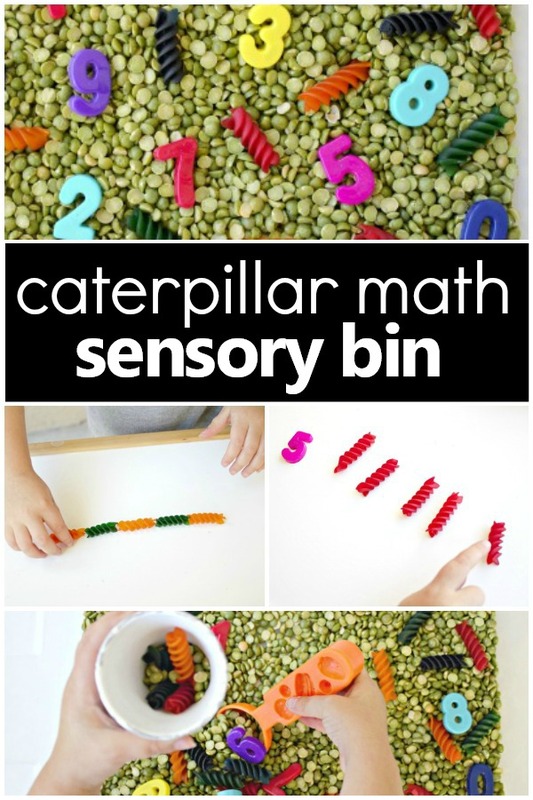 To begin your caterpillar math sensory bin exploration and fun, review the numbers and colors within the bin. 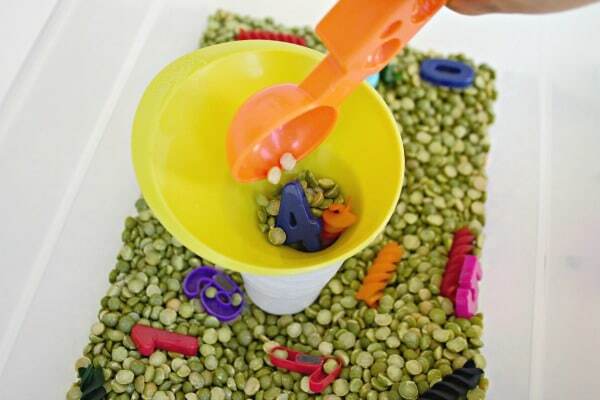 Next, invite your little learners to dig in and explore all of the materials and sensory bin tools. Sensory bins definitely promote imagination and relaxation. By the look on their faces and how long they enjoyed this bin, it was evident that it was fun and soothing to let the beans and pasta run through their hands. Notice what children are spending their time on and encourage open-ended math practice initially. For example, ask them to identify a number or color, then find that many caterpillars. 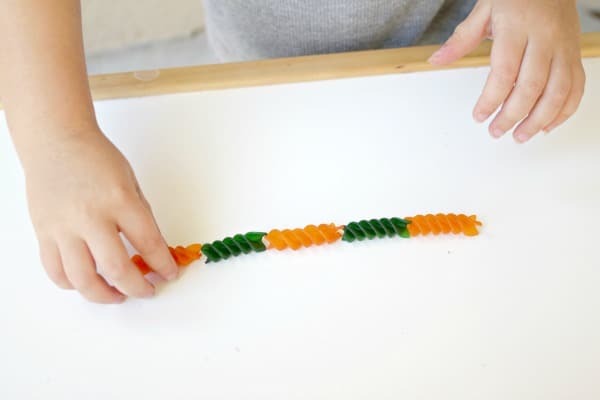 This is an excellent chance to work on counting and one-to-one correspondence. 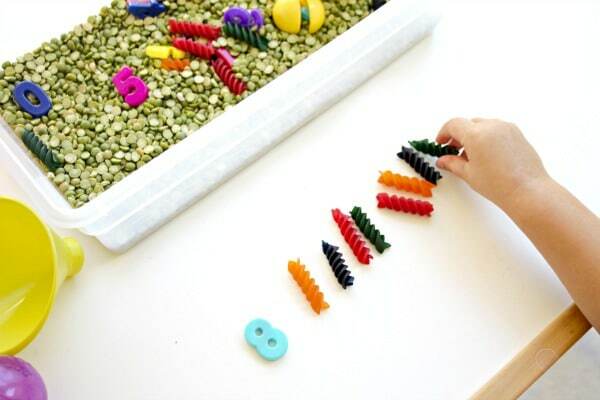 As they continue to explore, play, and imagine, offer examples of patterning, sorting, or even larger numeral combinations if appropriate. We had a lot of fun finding different ways to pair the pasta “caterpillars” with their friends. It also proved to be an excellent quiet time independent activity beyond our learning time. 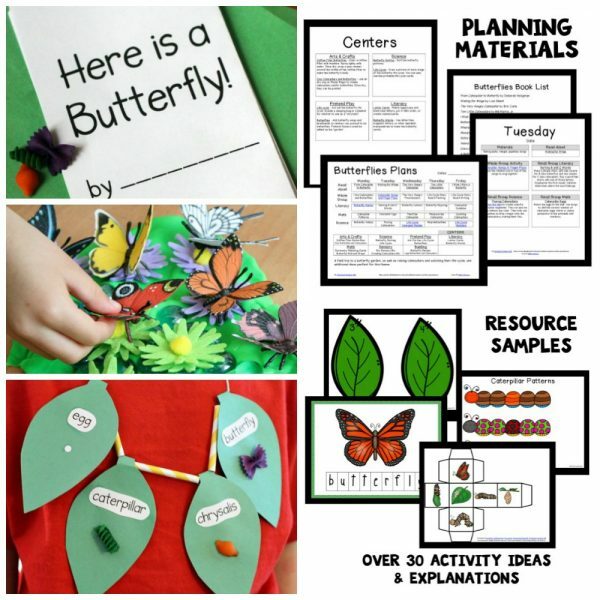 We hope you enjoy trying this caterpillar sensory bin to extend math and learning in your caterpillar and butterfly theme! What are some ways you incorporate cross-curricular hands-on learning?